See more information and photos of Emhartley. We (2 adults and a 4 year old) are planning a 16 night stay in SL in March / April 2018. After approx 9 nights on the south coast beaches ending at tangalle we would like to visit uda walawe (1 night) and then onto Ella for 3 nights before travelling back to the airport. Would you be able to advise as to the travel times between these 3 destinations and whether it would be sensible to book a driver for this part of the trip rather than one way taxis. Thanks. Emma. The prices are going to be about the same in this case. I would probably take a driver for the 4 or 5 days so that you do not have the hassle of booking a different one for each leg. Also you can use them in Ella to see the local sights and avoid the tuk tuk mafia! For travel times you can work roughly on 40-50km per hour as an average speed. In the hill country it may be down to 30km per hour. See more information and photos of Travel BeingdoM. Best way is book a driver and a car . 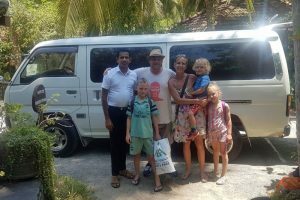 See more information and photos of Sri Lanka Tours and Car.